Hello all! I’m holding off on the Part 2 of my “On Being Vegan and Evangelical Christian” post to write about a lovely vegan event I attended in Salem, IN a few days ago that was just too good to keep for next week! 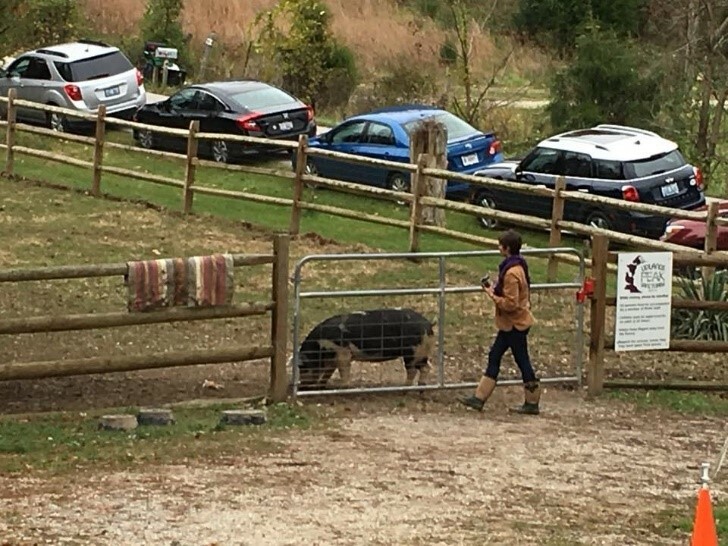 The Uplands PEAK Sanctuary is a humane, vegan farm dedicated to rescuing and rehabilitating animal victims of abuse; usually, this means removing animals from factory farms and backyard butcher situations, transporting them to the sanctuary, and treating them with care and love until they are back on their feet… and for the rest of their lives! 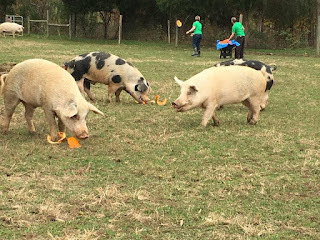 Every year, the generous folks who run the sanctuary hold PEAKSgiving, a one-day event featuring a keynote speaker, the opportunity to explore the grounds and get to know the animals, a pumpkin feeding for the pigs and goats, a vegan-friendly silent auction, and a delicious several-course vegan meal. The best part? All annual proceeds go toward the care of the animals on the farm! This year, PEAKSgiving took place on one of those wonderful autumn days when the skies are just the right shade of silver to augment the fiery leaves on the trees. The air was heavy and warm – for a while, my family and I were nervous that it would rain and that the event would be confined to a tent, but the clouds contained themselves this time. What first caught my eye was the Heine Brothers’ Coffee Stand. Heine Bros. is a local Kentucky chain specializing in organic, fair-trade coffee. I just about died when I found out they were giving away unlimited free cups of the magical stuff. Oh-em-gee. 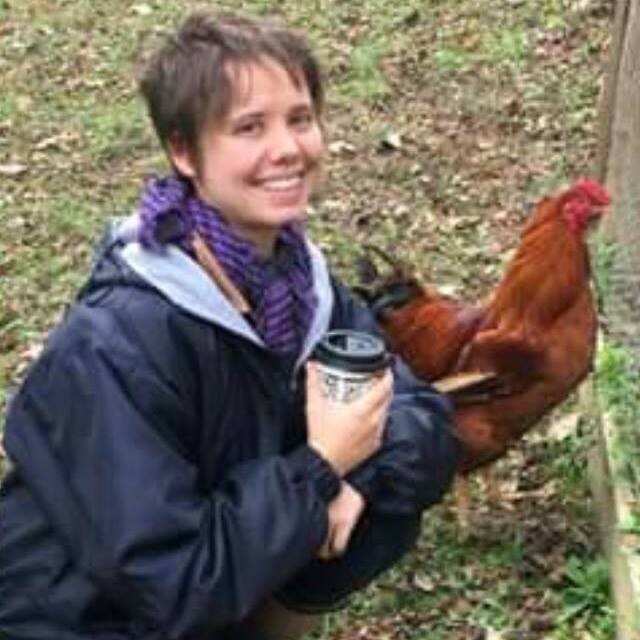 My new Facebook profile picture ft. a cup of Heine Bros. decaf and a friendly farm resident. Needless to say, everything was off to a great start. We sat down to a spread of cranberry brie cheese, “bacon” chive cheddar spread, crackers, and a green salad. It was all wonderful, but that cranberry brie – ooohhhhh I need the recipe for that. I picked up on the cranberries (obviously) and coconut oil, but the rest is a mystery that I’ll have to solve (future recipe post?). 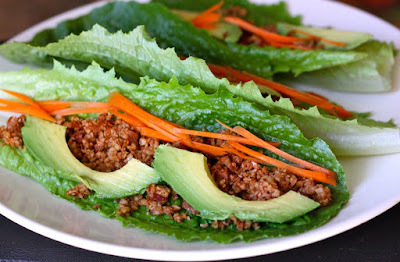 We also had the privilege of hearing some words from Kristin Lajeunesse of “Will Travel for Vegan Food”! Her dynamic, fun-filled speech about her vegan journey and animal ethics was inspiring, and I encourage everyone reading this to check out her website and Facebook page if you have the chance! After running back to the Heine Bros. tent to grab another coffee, my family and I wandered around the farm, taking in the beautiful scenery and talking to the animals (our meat-and-potatoes family would have thought we were as cuckoo as the roosters, but they talk to their dogs, so…). To be honest, I don’t think I’ve ever seen animals in such good condition, even in zoos. The chickens I’ve grown accustom to seeing are scrawny, scraggly creatures short of a few toes. These chickens were plump, preened, and plenty happy, clucking and crowing their contentedness. The cows napped quietly in a lush green pasture, relatively free of the biting flies and other undesirable insects, and the pigs were so hefty and strong that they brought to mind the huge wild boars portrayed in movies. I’m not one to display strong emotions around animals, but seeing them in such good condition was moving, somehow. They also had a photo booth! 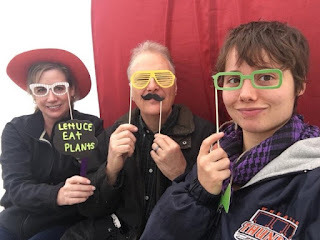 My parents and I dipped in to take a propagative picture in order to indoctrinate our Facebook networks. At last, the bell was rung for the pumpkin feeding. Once all 100-or-so guests had lined up along the sides of the pasture, volunteers rushed in through the metal gate behind wheelbarrows full of fat orange pumpkins. The pigs and goats clearly knew what was going on, because as soon as the volunteers took center pasture, they stampeded toward them, eagerly mowing the air. Volunteers carried pumpkins to each animal, smashing them on the ground and playfully wrestling with the determined animals over the larger pieces. The contented grunts and crunches could be heard across the farm. If I had that much pumpkin, I’d probably make similar noises. So, overall, PEAKSgiving and Uplands Peak Sanctuary were lovely. Rarely do I come across people so hardworking and dedicated to animals and their well-being. All that to say, if you’re looking to be inspired, eat amazing food, and contribute to a great cause, consider joining them next year, and hit me up, too!